Shree Ramkrishna Netralaya is now able to offer you the next generation of multifocal intraocular lenses (IOL’s) – the trifocal. This implant gives patients a better chance to enjoy clear vision at all distances with maintained contrast sensitivity and lower visual disturbance. The older generation multifocal lenses offer clear distance and near vision, however they are least clear for intermediate vision and can result in glare and haloes especially with night driving. The trifocal implant has the advantage of offering clear intermediate as well as distance and near vision with minimal glare and haloes at night. The trifocal implant significantly improves intermediate visual acuity enabling patients to feel more comfortable performing their intermediate distances activities. The trifocal implant produces images with high resolution for all distances under all light conditions. You will be able to switch back and forth between targets at different distances without the need to put on corrective glasses. becomes evident when compared with the performance of older generation multifocal lenses. 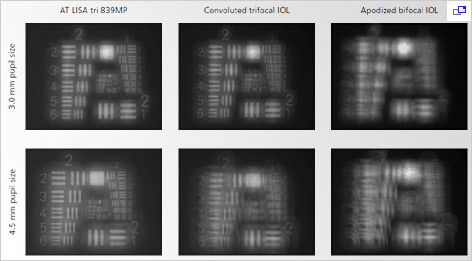 Trifocal implants display far better intermediate visual performance, even under poor light conditions. Even poor light conditions have only a minimal influence on the good functional vision achieved by trifocal lenses at all distances.